A series of rail accidents in South Korea may dampen enthusiasm for spending money on the North’s rail system. There have been two major sets of stories involving Korean railroads in recent weeks. While many outside observers are closely following the South’s surveys of the North’s rail system to prepare for future infrastructure upgrades, a series of accidents culminating in last Saturday’s high-speed train derailment in South Korea continues to capture national headlines there. The derailment of the Seoul-bound KTX train on the Gangneung line – opened less than a year ago in preparation for the PyeongChang Winter Olympics in February – left 15 people injured. Preliminary findings indicate the accident was due to a malfunction in the rail switch system caused by cold weather, though this verdict could change depending on the results of an ongoing government investigation. The derailment is the 10th accident on South Korea’s high-speed rail system in just three weeks. Despite the steady decline in train accidents over the past decade, recent assessments suggest there are still major safety issues with South Korea’s state-owned railway operator, KORAIL. 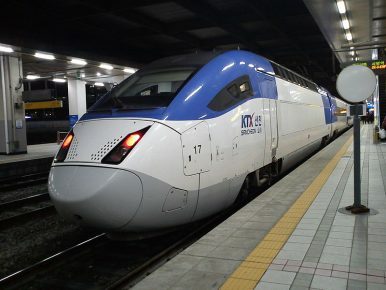 In criticizing KORAIL, National Assemblyman Hong Chul-ho cited a report showing there have been 661 train accidents between 2013 and July this year, 109 of which involved high-speed KTX trains. Of the 51 accidents this year, 22 of them were caused by some form of mechanical error. Amid heightened public scrutiny, the Moon administration is attempting to save face for its embattled national rail system. KORAIL CEO Oh Yeong-sik, the Moon appointee with no previous related expertise at the center of public criticism, stepped down on Tuesday. The administration also clearly understands the larger implications of its recent problems. Speaking from the derailment site, Minister of Land, Infrastructure, and Transport Kim Hyun-mee said, “While these accidents continue, it is quite embarrassing for us to have a big dream of winning overseas railway contracts or connecting the rails between the two Koreas.” Although there are certainly reasons to be worried about how its rail system is viewed by potential partners, the Moon government should be equally concerned about perceptions at home, particularly as they relate to inter-Korean rail ambitions. Connecting South Korea’s railways to North Korea’s is a key pillar of President Moon Jae-in’s “New Economic Map of the Korean Peninsula” – itself a major foreign policy priority. Seoul’s ongoing surveys of North Korea’s railways are seen as the first step in this strategy. The inspection results are not yet publicly available, but previous estimates put the cost of modernizing North Korea’s rail network at 43 trillion Korean won ($38 billion). As a sizable investment in North Korea that could otherwise be spent to help a struggling economy at home, the initiation of the project – though it is still unclear when, if at all, sanctions will be lifted for this to happen – is likely to cause a stir among South Koreans. Tacking on safety concerns with KTX will only add fuel to the fire. Experts claim budget cuts to track safety measures are behind the recent string of accidents. KORAIL slashed its budget for hiring track maintenance workers by 10 billion won between 2015 and 2017. The state-owned company has come under financial pressure in recent years, posting a nearly 500 billion won operating loss last year. As the Moon administration continues to look to connect with the North Korean rail network, it should be cautious of the problems domestic train safety issues could cause. Should the day come and these issues still persist, many South Koreans will be asking why the government is spending tens of billions of dollars on railway projects in North Korea when they can’t even afford to spend the millions of dollars needed to keep them safe. Spending money on domestic track safety now is a necessary investment for the Moon government, both to protect South Koreans and for its broader foreign policy goals. Could South Korea's era as a 'geostrategic island' be coming to an end?